SAVE $100 ON TWO ADVANCED EXCEL® CLASSES. 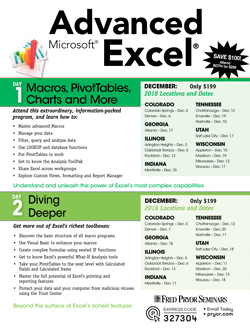 Attend both Advanced Microsoft® Excel® seminars for one low price. The basics of Excel aren't difficult to grasp … but mastering advanced techniques can be trickier. In fact, unless you are adept at deciphering complex manuals, have loads of extra time for tutorials or possess a strong motivation for self-learning, you may find boosting your skills and knowledge of Excel is easier said than done. Until now, that is! Advanced Microsoft Excel training gives you an exceptional amount of concentrated information in just one extraordinary day of training. If you're comfortable building a worksheet, using cells, entering data and creating basic formulas, this program will take you to the next level of Excel expertise. Instead of hovering at the "tip of the iceberg," you'll drill down through Excel's complex capabilities and discover how easily you can expand your knowledge base to become a more confident, capable user. This course is jam-packed with skills, tools, ideas and strategies gathered from professional users, tech experts and Excel gurus who know this application inside and out. You won't waste time rehashing how to create spreadsheets, input data, perform basic mathematical calculations, save workbooks or edit cells. Instead, this training builds on what you already know, focusing on the advanced techniques that will take your skills to the next level. Your trainer is an accomplished Excel expert who will walk you through dozens of time-saving shortcuts, smart strategies and more with a helpful mix of computer-screen projections, demonstrations, instructor-led exercises and plenty of Q & A time. You'll get practical, real-world answers to your toughest Excel questions and challenges, and come away from this course ready and able to put your new skills to work the very next day. Gain all this and more in just one day of concentrated learning! Master formatting effects to make your pages look like you spent hours — when all it took was a few mouse clicks! Building familiarity with Excel’s advanced features can help you boost productivity, give you better insight into your data, save you time, and allow you to create vibrant, persuasive reports. This seminar is appropriate for the Intermediate Excel user looking to expand their knowledge of Excel’s hundreds of features and to use familiar tools at a deeper, richer level. Anyone who tracks and analyzes data - such as teachers, researchers, marketers and small business owners - will benefit from a greater comfort level with Excel’s sorting, filtering and analysis tools. Team leads and managers can save valuable time by creating efficient, re-usable reporting tools with macros and forms. The home office user will appreciate the usefulness of Excel’s many functions that make accounting, budgeting and shopping research quick and easy.